Acquainting how to create an image of a hard drive can greatly help you protect the data security of your hard drive. AOMEI Backupper is the best tool to realize this operation. Why create an image of a hard drive? Data is the core of both business and general users. Malicious software, natural disasters and hard drive fails can cause data loss. Important files - like your critical work documents and personal photos deserves the best backup solution to protect against those probability of data loss. Knowing how to creating an image of a hard drive can not only protect your data security, but also restore your data easily once your hard drive fails or data loss happens. To create an image of a hard drive is to create an image-based backup. Image-based backup is a backup process for a computer or virtual machine that creates a copy of the operating system and all the data associated with it, including the system state and program configurations. The backup is saved as a single file that is called an image. In other words, the result of creating an image of a hard drive is a disk image. How to create an image of a hard drive? How to create an image of a hard drive? The primary thing is that you need to find a hardware indemendent imaging software for Windows. What is the best tool to create an image of a hard drive? Firstly, the tool should have the ability to create a disk image efficiently. Secondly, it should have the simplest operation when completing the function. Besides that, the intention of using a tool is to save our cost in time, energy and money. So the disk imaging tool need to be cost-effective. AOMEI Backupper is the best tool you can choose to create an image of a hard drive. 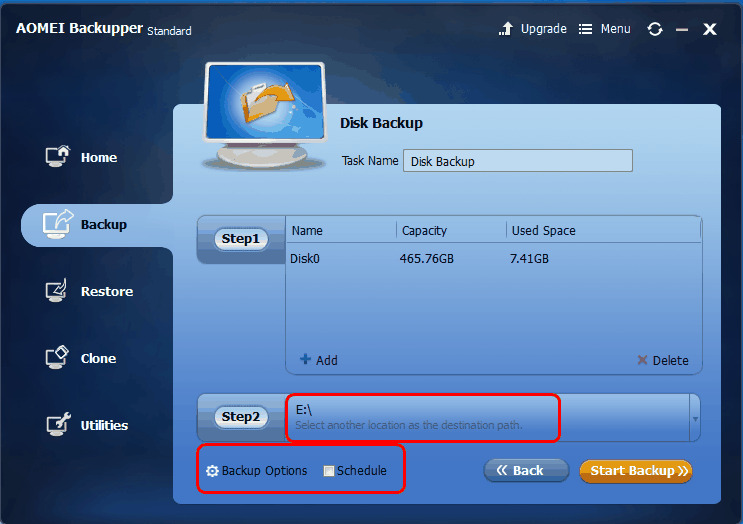 AOMEI Backupper has all-inclusive backup functions which including disk imaging. And its intellectual user interface gives user the best user experience. What’s means much to most customers may be the price of it, AOMEI Backupper is free of charge. So why not choose AOMEI Backupper to create an image of a hard drive? Now we create an image of the local hard drive of your computer to an external hard drive. Then I will show you how to create an image of a hard drive. Step1. Download AOMEI Backupper, install it. Plug the external hard drive you used to store the disk image. 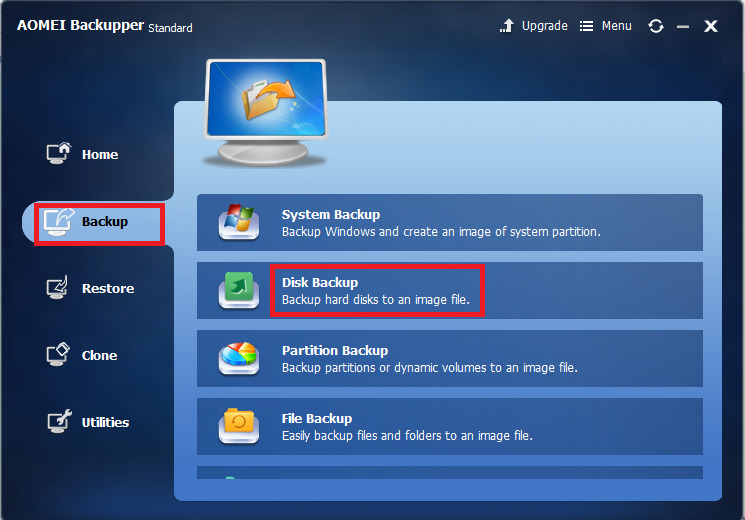 Launch AOMEI Backupper, click Disk Backup under the Backup option. Step2. Choose the disk(Disk0) you want to backup. Step3. Click the “Step2” to choose the external hard drive E:\ as the destination path. Step4. Click Start Backup to begin the backup. After backup is done, click Finish to close the interface. 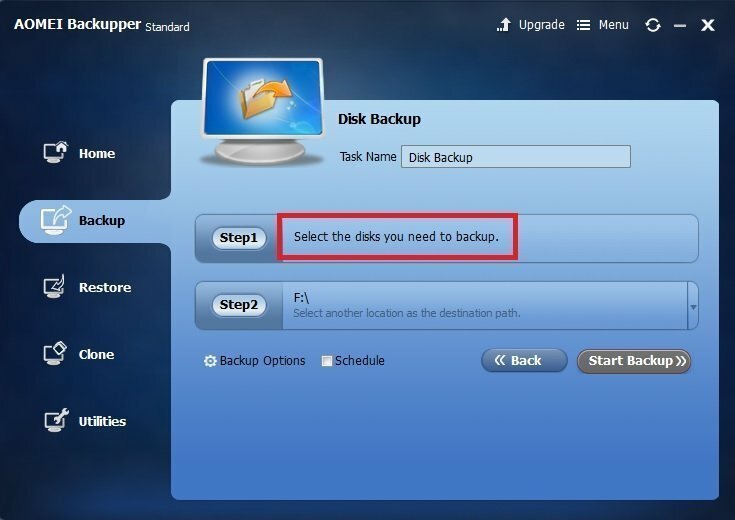 ● You can check the Schedule box to schedule an automatic backup. ● You can also backup files to NAS to store your image of hard drive.